In my last post, I posed the question: Why do students engage in a course, when they began intending to lurk? So I thought I’d do some more fishing, to see if I could identify students who, at the end of the course, were motivated to do it again for a Statement. Because if we could identify these students before the course, maybe we could get them to engage more fully the first time around. How likely would you be to take this course again to earn a Statement of Accomplishment? We launched 2 post-course surveys, one for students who earned a Statement of Accomplishment, and one for students who did not. The post-course survey for students who did not earn a Statement got 178 responses. So, a very small fraction of the students in the course — however you want to define “student.” But that’s how it goes with surveys. The course supports my current academic program. The course supports my current job responsibilities or company’s line-of-business. The skills from this course may be useful for obtaining a new job. I am taking the course out of general interest, curiosity, or enjoyment. The responses to all of these were the following scale: not at all important / moderately important / important / very important / absolutely critical. Of course there are other questions on the pre-course survey that might be diagnostic, but I started with these. Somewhat surprisingly, students were no more or less likely to want to take the course again, if they took the course the first time to support a current or future job. Who would be likely to take the course again to earn a Statement of Accomplishment? Students for whom the course absolutely did not support their current academic program. Students who are likely to take the course again to earn a Statement, are those who took it the first time around out of general interest. It wouldn’t be difficult to identify students who are taking a MOOC out of general interest, prior to the start of the course. The question is, what could be done to motivate them to participate more fully in the course, so that they could earn a Statement or a Certificate or whatever? 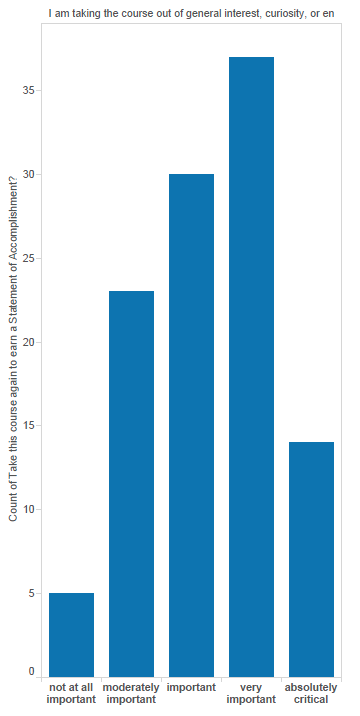 If, as seems to be the opinion of many, we want to increase MOOC completion rates.